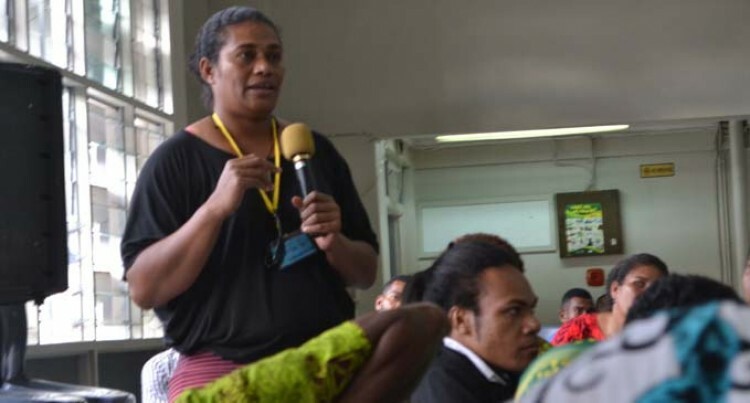 Lenisa Diyarailagi raised her concern during the Youth Conference Talanoa Session at Civic Centre, Labasa. Photo: Selita Bolanavanua. Training programmes are available to bridge the gap for school dropouts, says Divisional Youth Officer Mere Ratukonadi. “School dropout is a focus of the ministry and we provide training and community-based programmes to help youths,” Ms Ratukonadi said. Ms Ratukonadi was responding to concerns by youths in the Northern Division during a divisional youth conference talanoa session at the Labasa Civic Centre. The concern was raised when a youth rep from Taveuni raised the question: What can be done about the school dropouts in the community? “In Taveuni, most of us only have primary level education and it creates a big barrier in finding jobs,” he said. Another youth representative from Wailevu, Cakaudrove, Lenisa Diyarailagi also highlighted a problem their community was facing. “We are always out of reach due to the network problems and it has been a communication barrier for us,” she said. Wainiika Village youth club president Apete Waqa highlighted the importance of providing training for the youth in urban areas especially for males. “We have been working on our youth scheme programme focusing on housing young males,” he said. He said the training would enable them to be more independent and stand on their own two feet. The youths were assured by the ministry officials that their concerns and issues were very significant and it would be taken into consideration.